Please use this thread for Glastonbury UK Rolling Stones 2013 show planning. Edited 2 time(s). Last edit at 2013-06-26 07:24 by bv. Leave this show to the usual Glastonbury goers. Glad to see this thread...I've started my planning, me and Mrs Mouse are driving down on the wednesday, meeting friends at the site, a few days wandering around the vastness which is Glastonbury then Saturday and the greatest rock and roll band will grace the best stage on the planet. I shall be suitably loaded and ready to watch the band I've followed since I was 10 for what will be most likely my last time. Hoping to to say Hi to any IORR's who are also going. I've got my Keith at Sands Point limited edition T-shirt ready for the show and all I need now is the sun! Well I missed out on tickets first time around, despite trying very hard indeed! Maybe I'll have more luck when the next lot go on sale. Then maybe I'll see you there. Good luck for the re-sale. Nearer the time I will give you some tips on how to get them. THis will be my 11th Glasto and I've learned a lot over the years about getting tickets! so i hope i have luck... will there be any other re-sale after this one? because i heard something like that. Hope anyone going has a great time, I must admit, I would have liked to have gone myself, been to 15 Glastonburys over the years (and loved them)...just a bit too much hassle involved nowadays. If it pours with rain at the site on June 29th, I've made the right decision. If it pours with rain at Hyde Park on July 6th, I've made the wrong one! I think you are one of the very few lucky people on IORR to be definately going to the whole festival. Lol, I'm 51 mate and have been saying since the 80's that I'm too old for it...2011 nearly killed me with the mud and rain, but for the Stones it will be worth it. GOing to take lots of photos for those who can't amke it! Plan ? Eh ? What's to plan ? The only event worth planning for is the ceremonial destruction of every tent in the land (I suggest death by fire), plus the introduction of a new law banning rainfall during Rolling Stones concerts. Got to admit, I hate camping, loathe it...it's ok at night sat around the fire with a spliff and a drink but morning - yuk. Damp, cold, clothes all over the place. I just about get through the 5 days with the help of going back to the car most days to freshen up and have a decent sit down in a civilised environment. Hopefully it will be worth it. I'm 100% with you there, it's not the "camping per se", it's "camping in the UK" under its grey dreary rain-sodden skies that I just can't stand personally. Great country the UK, for lots of things, but camping just isn't one of them. Tents are for ........ well places where it's hot and dry basically, that's my take on it. 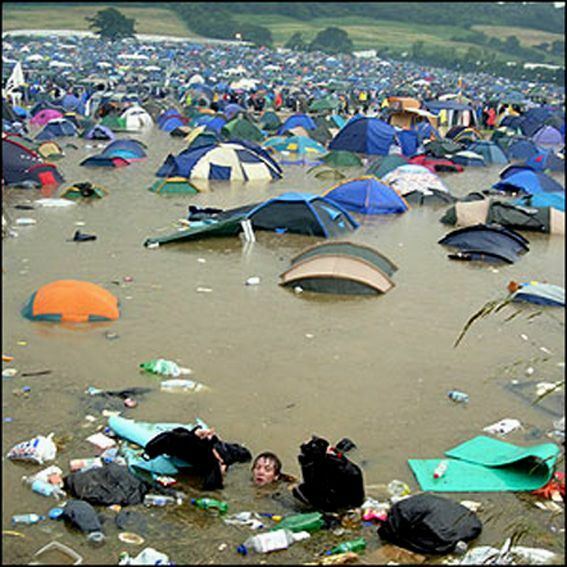 If you're going to Glastonbury, this is the kind of eventuality you have to plan for! OK Crumbling Mice, I'm just teasing...been there loads of times myself, and though I'm a year younger than you, not sure if I would go again. Never say never though, I certainly miss the atmosphere. It comes over a bit on TV, but no substitute for being there. I'm sure you'll have a great weekend. Just to prove that it is often sunny at Glasto, here is a photo of me from 2010! As you can see I'm proudly sporting my Stones T-shirt and a little of my Tattoo You tattoo is visible! Ugh ............... yikes !! Not for me, not EVER !! Glastonbury 2010 pic...Oh yes, that's the kind of Glasto I like to remember. 1997 was a mudbath, and it was raining while I was there in 1998 (I actually left early, the only time ever)...but 1999 and 2000 were glorious, maybe my favourite years of the lot. The weather can make or break a festival. Edited 1 time(s). Last edit at 2013-04-04 23:15 by lmatth8461. Agreed on that one Lee - 2011 nearly killed me, heavy rain for days, deep mud, queues for toilets like never before, we escaped on the Sunday afternoon, I've never been so glad to see a Motorway Service Station. THink this year will be my last whatever the weather. Hey now! The mud had all pretty much dried up by lunchtime on the Sunday. It was sunburn o'clock from Saturday afternoon onwards! Lol, correct, Sunday was a heatwave, but by then we'd had enough and I'd got a lousy cold! In a way it made things worse with the sun as it dried the mud so your feet were stuck in, people were falling out of their wellingtons! There you go. Schoolboy error. Stout pair of walking boots were what was required. But, yeah - funnily enough, I'd take 2010's weather over 2011's. As someone attending both Glasto and Hyde Park, it's not the weather that worries me so much as the weedy sound-system at the latter. Well if you remember even the Glasto sound system for U2 was a bit pants..they sorted it out by Saturday and usually it is brilliant. Hyde Park could be a little patchy though. Need to find out what the best way to travel by train is.... To London and from London to the festival? Judging by the little head in the foreground, that water must be bloody deep! I congratulate everyone who goes to Glastonbury, but it is not for me. The thought of going to the toilet, knowing the world and his wife have been there before me is not a pleasant one. The comments about the weather affecting things is totally correct. Some of my mates went a long time ago and got soaked early on and stayed that way for the duration as there was no means of getting dry. For me this can't be healthy. Well done everyone who got tickets. I hope you get a great Stones gig and a great festival, but for me this is one Stones gig on home soil I am not disappointed at missing out on! Good to hear Mick saying he is looking for song ideas for the Glastonbury set. Can you all flood him with Let It Loose. BV can you not make this a sticky, I'm sure as time rolls on it will have sunk way back into the archives of iorr if you dont and then we'll get several threads appearing. Was so bummed about the Hyde Park T1/ T2 fiasco that it had almost slipped my mind that I'll be seeing them at Worthy Farm the week before. Hell yes, I reckon the Glasto appearance might be a classic. No band turns up as headliners and then puts on an average show at Glasto. I think there will be a few surprises. Pray for a dry weekend mate!